Paper - white card, pale yellow card, 4 papers from MME Miss Caroline collection (the lace is paper too - not sure if it shows). Image - Effie Trinket Sassy 2 from Sassy Studio Designs coloured with Prismas. She is a full length image, but I cut her off at the knees. 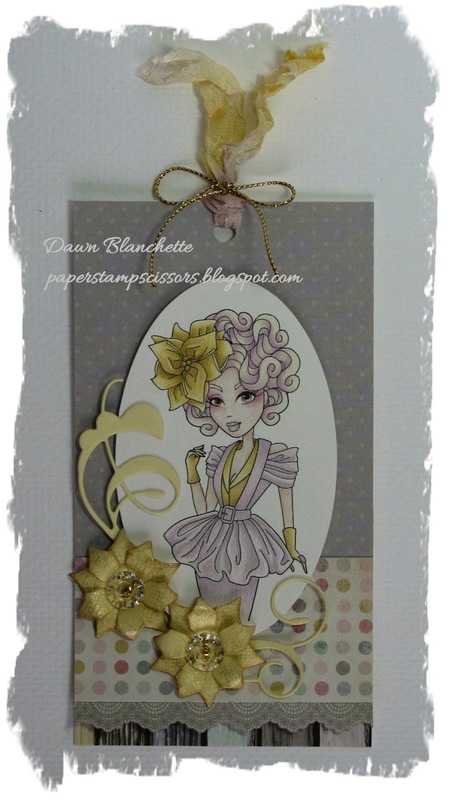 Flowers, buttons & glitter - flowers are a poinsettia die cut by Spellbinders. I put some Stampin' Up buttons in the centers and gave them a spritzing with Lindy's Stamp Gang Glitz Spritz in Blazing Sun for my glitter. Ribbon/bow - I used seam binding ribbon died with DI scattered straw and milled lavender and added a bow make from gold cord. Other - flourish is Darrington Corner by Memory box. OMGosh - I have never had a die cut just fall out of the die the way this one did! I didn't have to poke it out or fight with it - it literally just fell out all by itself. I will definitely be getting more Memory Box dies! For this one, I just cut off the bits I wanted as it is a large corner die. The team created some beautiful projects for your inspiration, so do pop by Creatalicious to check them out. Sassy Studio Designs is providing our lucky winner with 4 digi images of their choice! I hope you will join us this month and I look forward to seeing your creations. Thanks so much for stopping by and for taking the time to leave a comment. I really appreciate them and love having the chance to visit you too. WOW!! This is gorgeous Dawn. I love the image, beautiful colouring and the flowers and design are wonderful. Wow this is lovely Dawn. 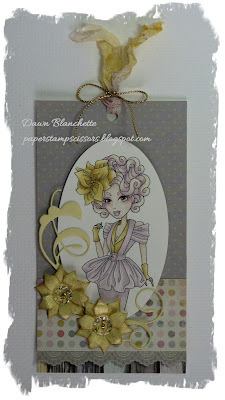 I love the yellow and grey combo, it's one I haven't tried but I really must! What cool colour choices! They look just wonderful. Love how your flowers turned out using that poinsettia die and what a yummy flourish!! Beautiful card! I love your colour combo.